Toronto, Ontario--(Newsfile Corp. - December 11, 2018) - Palamina Corp (TSXV: PA) has completed further channel sampling in the Veta Zone at the Coasa Gold Project in south eastern Peru. 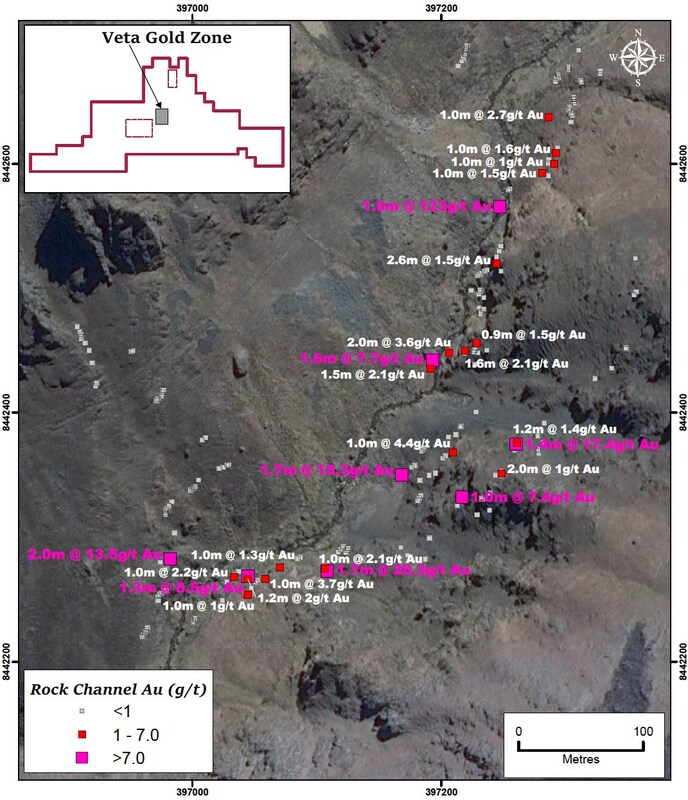 The most recent sampling results compliment previous surface sampling programs with channels collected partially as infill sampling along previously sampled outcrop as well as from previously unsampled outcrop occurrences. The Veta Zone continues to return high-grade gold mineralization highlighted by channel samples returning 123 g/t Au over 1.0m, 26.3 g/t Au over 1.7m, 18.3 g/t Au over 1.7m, 17.4 g/t Au over 1.4m and 13.5 g/t over 2.0m. A completed DIA social-environmental impact permit application is scheduled to be submitted to the Peruvian Ministry of Mines before the end of 2018. Granting of the DIA will allow for surface excavations, road making, trenching and drilling to be carried out over the Veta and Phusca Zones. Andrew Thomson, President of Palamina stated, "Results from the latest Veta channel sampling continue to return noteworthy gold values over an approximate 400m strike length within the previously reported 800m x 500m anomalous area. While gold mineralization is predominantly associated with structurally controlled quartz veins, on-going sampling also demonstrates the presence of gold mineralization within the shale and siltstone host rocks. The system remains open-ended and Palamina is currently permitting sites for first pass trenching and drilling." Recent field observations are confirming the open-ended nature of the Veta Zone. Veta is 1 of 9 geologically and geochemically anomalous areas identified on the Coasa Gold Project to date by Palamina. Palamina's quality assurance/quality control (QA/QC) protocol is administered on all its exploration projects. Prior to delivery of field exploration samples to the analytical laboratory, with the objective to provide an independent check on precision, accuracy and contamination in the laboratory, Palamina QA/QC staff insert coarse blank samples, field duplicates and certified reference material "standards" into the sample stream. To assure best practice compliance, assay results are only reported once the results of internal QA/QC procedures have been reviewed and approved by a Qualified Person. All assays are performed by Certimin S.A. with sample preparation in Juliaca, Puno Province and analytical assays at the Lima analytical laboratories. Reported assay values are uncut. At the laboratory samples are dried, crushed, and pulverized and then analyzed using a fire assay - AA finish analysis for gold and a full multi-acid digestion with ICP-AES analysis for other elements. Samples with results that exceed maximum detection values for gold (10 ppm) are re-analyzed by fire assay with a gravimetric finish and other elements of interest are re-analyzed using precise ore-grade ICP analytical techniques. Mr. Donald McIver, M,Sc Exploration and Economic Geology, a Fellow of the Australian Institute of Mining and Metallurgy (FAusIMM), as well as the Society of Economic Geologists (FSEG), is Vice President Exploration for Palamina Corp. He is a Qualified Person as defined by National Instrument 43-101 and has supervised the preparation, compilation and review of the geological and technical contents of this press release. Palamina has acquired the application and mining rights to five gold projects in south-eastern Peru in the Puno Orogenic Gold Belt (POGB), one copper-gold project in the coastal I.O.C.G. belt in Southern Peru and holds 100% interest in one exploration project in Mexico. Palamina's Peruvian based exploration team have a cumulative 35 years' experience in the POGB and are supported by a board of directors and advisors who are proven mine finders, deal makers and financiers. Palamina has 29,621,381 shares outstanding and trades on the TSX Venture Exchange under the symbol PA. This news release contains certain "forward-looking statements" within the meaning of such statements under applicable securities law. Forward-looking statements are frequently characterized by words such as "plan", "continue", "expect", "project", "intend", "believe", "anticipate", "estimate", "may", "will", "potential", "proposed" and other similar words, or statements that certain events or conditions "may" or "will" occur. These statements are only predictions. Various assumptions were used in drawing the conclusions or making the projections contained in the forward-looking statements throughout this news release. Forward-looking statements include, but are not limited to, the use of proceeds of the Offering and the Company's future business plans. Forward-looking statements are based on the opinions and estimates of management at the date the statements are made, and are subject to a variety of risks and uncertainties and other factors that could cause actual events or results to differ materially from those projected in the forward-looking statements. The Company is under no obligation, and expressly disclaims any intention or obligation, to update or revise any forward-looking statements, whether as a result of new information, future events or otherwise, except as expressly required by applicable law. A more complete discussion of the risks and uncertainties facing the Company appears in the Company's continuous disclosure filings, which are available at www.sedar.com.